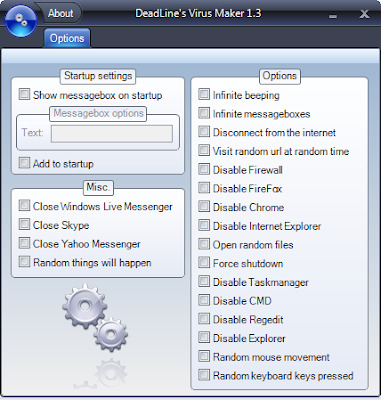 DeadLine's Virus Maker is free virus making software.It is simple and easy to use.some times you see the notepad virus making tricks but it is not so effective. It has nos so option but t can be used as a nice prank. if you want to get revenge from your friend so you can use the virus made by DeadLinene's virus. Download DeadLine's Virus Maker setup version. Install the setup version of DeadLine's Virus Maker. You can make many type of virus by clicking on ticks,You can show message on startup.If you want to close Messengers like skype,Yahoo Messenger,Windows Live Messengers.There are many options in sidebar. If you add The virus in startup every time victim start his pc the virus will run automatically.I will recommend not to run virus on your own pc. i have use that viruz to my comp...what can i do?